Having played at landmark venues around the world including Carnegie Hall, Curtis Institute, Wigmore Hall, Purcell Room, Barbican Hall, and Kings Place, they also regularly escape the stage to appear at museums, galleries, theatres, pubs, in an IMAX Theatre, on a fishing boat, in a cave, and on iceberg sculptures as part of a Greenpeace campaign. In autumn 2018 they took part in a critically acclaimed tour of UK planetariums, in association with Sound UK. They have commissioned many new works and have collaborated with artists from all types of musical backgrounds including Anna Meredith, Stef Conner, Elliot Galvin, Kerry Andrew (Juice Vocal Ensemble), Laura Jurd, Meilyr Jones, Neil Hannon (The Divine Comedy), Seb Rochford (Polar Bear), Shabaka Hutchings (Sons of Kemet), Shed 7 and Submotion Orchestra. 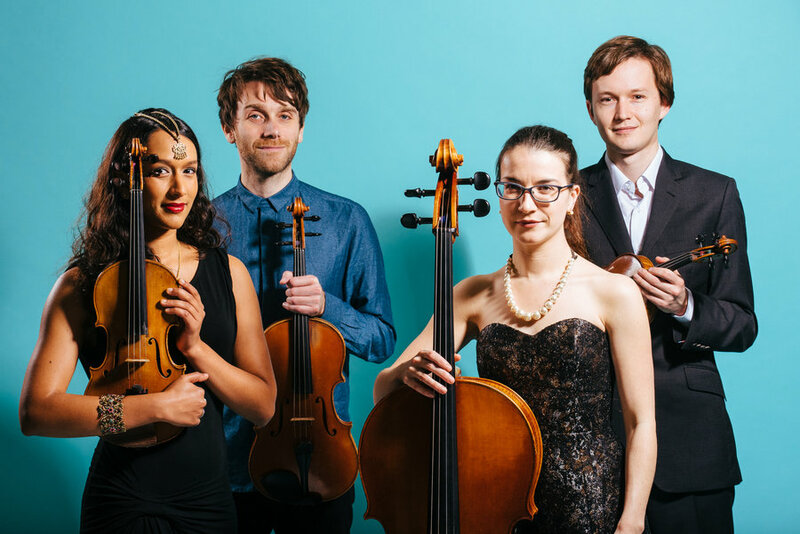 They are currently working on a long-term project with Ernst von Siemens prize-winning composer Christian Mason to create a series of Songbooks for string quartet, based on overtone singing traditions from around the world. The Quartet are passionate about supporting emerging composers and taking new music to diverse audiences. As Ensemble in Residence at Cambridge University, Sheffield University, and Goldsmiths, University of London, they regularly lead composition workshops, and undertake education and community outreach work. They took part in the Cheltenham Festival Composers’ Academy 2017, and became City Music Foundation Artists in 2016.